Good lyrical tenors seem to be thirteen a dozen in the German-peaking world at the moment. Singers like Lothar Odinius, Marcus Ullman, Jan Kobow have made their marks in lieder as well as in other repertoire. To their illustrious company young Daniel Behle can now be added. I heard him almost exactly a year ago – on 31 May 2008 – as Prince Ramiro in the Stockholm Royal Opera production of Rossini’s La Cenerentola (see review) and then I described his voice as ‘mellifluous, agile, beautiful, technically spotless and with enough heft to make his top notes ring out – in fact some of the most refined and vital Rossini singing I have heard in the theatre for quite some time’. These plaudits are equally applicable to his singing on this debut recital disc, recorded only weeks after the performance I saw. Born in Hamburg he studied singing with his mother, the soprano Renate Behle, whom I heard as a superb Leonora in Fidelio at Savonlinna more than fifteen years ago. Daniel Behle has been awarded several prizes at international singing contests, among them the Queen Sonja Contest in 2005 in Oslo, where he also received the Troldhaugen Grieg Prize – no wonder then that he wanted to include some Grieg songs in his debut recital, which is a mix of established favourites and some unhackneyed repertoire. There is no lack of competition in the field of Schubert and Beethoven songs and no newcomer can be expected to stand out against all the greats who have recorded the same songs. Schubert’s Der Musensohn is not easy to bring off, especially for a lyric tenor, when so many powerful baritones have already etched their readings into the memory of most jaded listeners. But Behle surprises with a force and energy that puts him far ahead of many fellow tenors and make them seem bloodless by comparison – and he doesn’t lack nuances. Ständchen is sung with exquisite legato, softly and beautifully and without imposing very much of ‘interpretation’. He trusts Schubert and lets the music speak. Ungeduld from Die schöne Müllerin is nervous and eager and he impresses greatly with his fine voice production and his top notes ring out effortlessly as they did at the Rossini performance mentioned above. The Beethoven songs are fine with an impassioned – but slightly restrained – Adelaide to play as a calling card to music loving friends unfamiliar with the singer. However, Beethoven as well as Schubert emerge as more or less preamble to what follows. I have stated before that the six songs Op. 48 is Grieg at his very best as song composer. Apart from Ein Traum they are not as well known as some of his other songs but they certainly grow in stature for each new hearing and they also find Daniel Behle at his very best: the inward and soft Dereinst, Gedanke mein, the energetic but nuanced Lauf der Welt, the beautiful Die verschwiegene Nachtigall and the concluding Ein Traum, building up from the softest possible opening to a glorious climax on the last Wirklichkeit. This was incidentally the song that won him the special Grieg Prize at the Oslo competition and it is easy to understand why. Grieg was a fluent German speaker and these songs came into being in 1884 when he and his wife Nina had reconciled after having split up for a year – as strong a source of inspiration as any. Whether Benjamin Britten also was fluent in German I don’t know. His Hölderlin-Fragmente from 1958 are anyway his only settings of German. They are certainly among his best creations, the sparse textures laying bare the texts, and I believe that no one hearing them for the first time can have any doubts as to the deep involvement on the part of the composer. In an interview Britten even called the cycle his ‘best vocal work ever’. 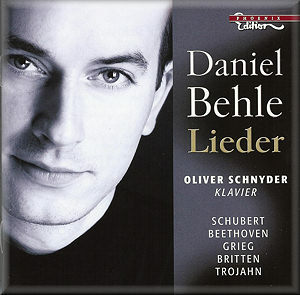 It is also hard to imagine the songs being more beautifully sung than by Daniel Behle. Peter Pears was no doubt unique in his understanding of Britten’s music and thoughts and his recordings will never be redundant but Behle also seems to have absorbed them and made them very much his own. This can be said with even greater certainty about Manfred Trojahn’s four Goethe settings, which were premiered by and dedicated to Daniel Behle. The background is interesting: At the Liederwerkstatt in Bad Reichenhall established composers like Wolfgang Rihm, Aribert Reimann and Manfred Trojahn met with young singers. Every year they devoted themselves to one poet and in 2007 it was Goethe. Due to other commitments Trojahn had only finished two out four planned songs. When he heard Daniel Behle singing them he was inspired to compose the remaining two as well. The songs are emotional, concentrating on ‘the painful process of departing love’. Manfred Trojahn has transferred these 200-year-old poems to the present day without loss of the universality and timelessness and found a musical language that builds bridges to bygone days. The songs should be accessible also to a wider public, not particularly specialized in ‘modern’ music. Abschied is enormously beautiful and the concluding Am Flusse, sung so beautifully and sensitively, shouldn’t leave anybody unmoved. With good recording, a sensitive pianist and good notes by Malte Krasting this is a disc that should win the young singer hordes of new admirers. A pity though that only the German texts are printed without translations. A recording of Die schöne Müllerin is scheduled for June this year (2009). I can hardly wait for its release.